The SightPro DP is a great sighting device that was made even better by expanding its capabilities with the addition of an ingenious 2X Power Booster. 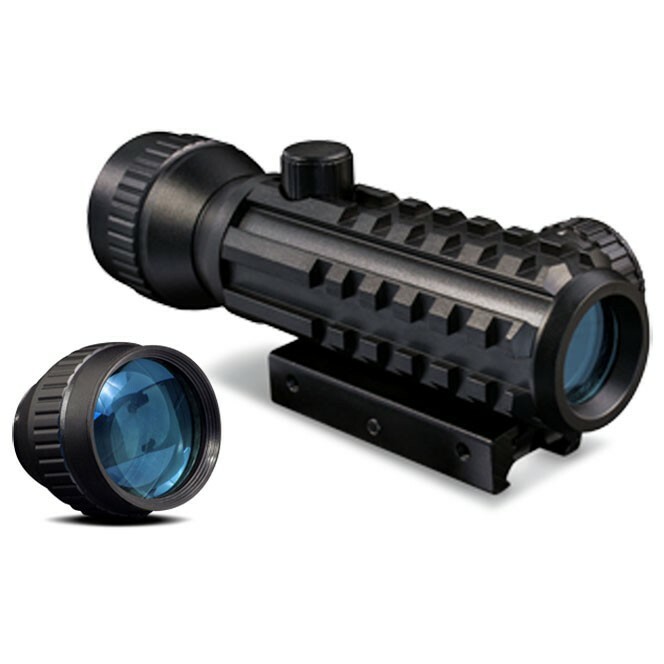 Using the dot sight at 1X power allows for close quarters use, tactical operations, and friendly target competition. Attach the 2X power booster, and accurate engagement at medium range targets comes into play. Thus, providing hunters with the ability to use the SightPro DP on pistols, shotguns, AR’s, bolt action rifles,and even black powder guns. The main body consists of 270 degrees of mil-standard rails for the attachment of a wide variety of accessories in varied locations. 30mm tube offers wider field of view. 1X and 2X magnification with removable lens. 7 position illuminated dot for all lighting conditions.